“I’m going crazy with verb TENER,” said my student Michaela. I don’t want you guys to be confused on this specific topic, so please watch this video I recorded a year ago for her. I’m pretty sure it will take some confusion away before you get into that specific lesson. 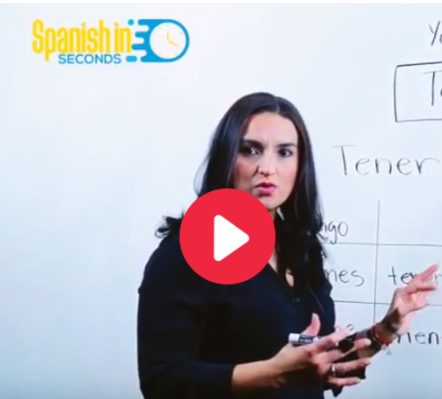 In this video, you will learn the different ways we use the verb TENER in Spanish. It’s important to understand that for the English expressions “I’m cold, I’m hungry, I’m hot..” we use the verb TENER. 2. I have eaten a chicken soup. On sentence number 1, in Spanish as in English, we use the verb TENER to talk about possessions. On sentence number 2, in Spanish, we use verb HABER. 1. Yo tengo un gato. 2. Yo he comido sopa de pollo. I’m pretty sure it will take some confusion away before you get into that specific lesson. Yes! feel free to share it!